The successful bidder of this lot will be able to invite 15 friends and family on an unforgettable week-long stay in a pristine, secluded paradise on the northwest coast of Madagascar. Marovasa Be is a manor house/boutique hotel set on a picturesque private beach. Located just minutes from the baobab dotted coastline of Moramba Bay, it is the ideal destination for snorkelling, kayaking, and waterskiing. A ski boat will be available too. The hotel’s pool and beaches are the perfect place to relax – cocktail in hand – while the sun sets over the Indian Ocean. After a day out on the water or reclining on the beach or by the pool, guests can dine alfresco in an open-air restaurant where Chef Max will serve up a locally inspired menu prepared with freshly sourced produce. Daily catches of fish, lobster and crab complement a collection of fine wines and housecrafted cocktails. · Dates of stay subject to availability. Best time to go is between May and December. · Lot includes free accommodation and staff services for a group of up to 16 people. · Winning bidder will be responsible for the cost of all travel to and from Madagascar and Marovasa Be as well as food, wine, spirits and fuel costs incurred. · Marovasa Be is reachable by private charter from Antananarivo/ Mahajanga/ NosyBe or by boat charter from Mahajanga. · Assistance with internal travel arrangements available. 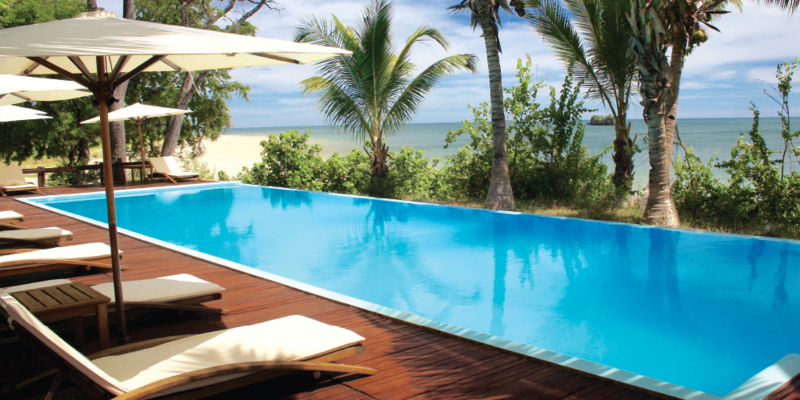 A week-long stay for 16 in a pristine, secluded paradise on the northwest coast of Madagascar.